Ah, what a weekend... Awesome gig last night at Pablo's in Epping, thanks to all who came! LISTEN AGAIN via the link at the bottom or subscribe to the podcast. Also try out FBi's on-demand streaming for better quality listening if you'll be online the whole time! There's some awesome new music this week, but the quantity wasn't quite as huge as it has been, which gave me the opportunity to revisit some releases I've been wanting to play again for a while. Tonight's opener was only played a couple of weeks ago, but Caribou manages to actually improve on Radiohead’s "Little By Little". A beauty. Next up is a pair of new tracks, from the new EP (literally released today, as far as I know) from Quench, an alternate name of Funckarma that they've used for their entire existence. Ostensibly it's a more melodic, gentler form of their music, but I've never been convinced of the difference here. In any case, there's some gold on this EP/album, and it features one of the first "ambient" versions that I've really loved, along with some of the dubstep-inspired beats they've been doing for a while. Another recent repeat is from Skeletons, whose brilliant album People struck a chord with me a couple of weeks ago. Surely it's their best yet, although the previous two were both great. "Grandma" is one of many highlights, with that slight African influence that so much indie music is displaying these days. Last week we heard Gareth Davis & Machinefabriek’s take on "My Funny Valentine"; this week it's the flipside, a Jazz Standard I'm not familiar with called "Oh Doctor Jesus", again a beautiful combination of slow, breathy clarinet melody and sparing glitchy interventions. Also new this very day (or perhaps this very weekend at least) is the first of Animals on Wheels’s 8 EPs in 8 weeks. A trashy guitar electronically dismantled. After AoW we finally make it to Australia, with the viola-led folky indie of Sailor Days aka Biddy Connor. I'd be a sucker for this sort of thing anyway, but it happens to be an extremely well-written collection of songs. Sydney's sleepmakeswaves on the surface make pretty familiar generic postrock of the LOUDquietLOUD variety, but actually do it really well. Not to be sneezed at (whatever that means). From Perth, Tangled Thoughts of Leaving are at least as much prog as postrock, with some jazz and classical influences and plenty of glitch. Utterly batshit crazy, but that's awesome. I raved about Tom Hall’s new album a week or two ago, and it remains very special. Detailed and beautiful. Also from Brisbane, Anonymeye finally has a new album coming out, and tonight's track showcases his fingerstyle guitar alongside his electronic production and an absolutely lovely piano melody following the guitar in the second half of the track. Last week's showstopper was the new album from Queanbeyan resident y0t0, and we had a few more takes from his new album tonight. First up was a remix by Leeds' Relmic Statute, who I found on Bandcamp, so we heard some lovely minimal beats and guitar from him as well. 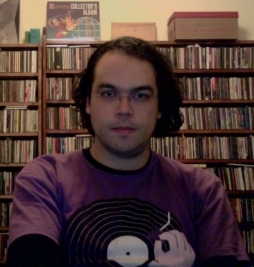 And then from a few months ago, Fabio Orsi with a very long minimal synth piece, and a track from his insanely good Preservation album from the start of the year. After the grainy sound of the Fabio Orsi track it seemed natural to have a piece from the wonderful debut EP from Clams Casino. And with no real logic, we then head back to an ambient take from y0t0, plus an indietronic remix by Downliners Sekt. The Esmerine album is really growing on me, and I liked it from the start. "Trampolin" is certainly a highlight, with its tuned percussion and lovely melody, but it's comforting listening as a whole album. Alexander Tucker’s new album Dorwytch is another I've been meaning to get back to for weeks or even months. It seems to me that the songwriting has jumped ahead since his ATP albums. There's still the emotional singing, string playing and folk-rock guitars, but this is one I really want to keep coming back to. Also with the strings are Wires Under Tension, whose take on violin postrock is unique and energetic, and joyfully carries you along with it. I've just about collected all the back-catalogue of aus now. I'm not sure how I missed his 2007 album on one of my fave labels moteer, but the gorgeous piano the leads into the soft bass tones in the closing two pieces is splendid. Once again, the new Jasper TX album, Black Sun Transmissions, is one of the albums of the year so far, and I haven't played it nearly enough. The way the soft droney field recording sounds grow with piano and trombone into something else entireley is really... something else! And finally, Chris Abrahams is in his most esoteric mode, helping ROOM40 celebrate their 10th anniversary from earlier this year. SO MUCH music for you tonight, kidz! I just managed to fit everything in that I wanted to, but there are some real beauties that arrived this week, which will be reappearing in the next few shows for sure. LISTEN AGAIN via the link below the playlist, or subscribe to the podcast. First brilliant release of the week comes from Clams Casino, whose Instrumental Mixtape was a free download earlier this year, is a bedroom producer who made his name making beats (those "instrumentals") for up-and-coming rappers like Lil B and Souljah Boy. The 5 tracks on this EP expose him as an incredible talent bridging experimental electronic, noise, shoegaze and contemporary hip-hop. It's released on the Tri-Angle label, home to such "witch house" (or whatever you want to call it) artists as Balam Acab and oOoOO. The boundaries between the white boys in their bedrooms and the "real" hip-hop scene are considerably thinner than they were when Cex and Kid606 were tampering with r'n'b 10 years ago. Texan producer Botany first came to my attention via a lovely remix of fellow Texans Balmorhea late last year. Western Vinyl have released an EP which, while slightly brighter and bouncier, fits nicely with the spaced-out jams of Clams Casino. And just in the last few days, Stereogum featured the aforementioned Balam Acab remixing Ra Ra Riot's Mathieu Santos, in familiar fashion. It's not that far from this US squashed-hop sound to the recent Radiohead remixes. I'm going out on a limb here, but it's just possible that Caribou’s remix of "Little By Little" is better than the original, with that beautiful harp, bouncy beat and scribbly synth lines. The Harmonic 313 is different from the original, which I love enough that I won't declare this remix to be better, but it is also gorgeous. And speaking of remixes, just in is a promo of Four Tet remixing Tuareg (North Saharan nomads) superstars Tinariwen’s single "Tenere Taqhim Tossam". We stick with remixes again with UK genre-crossing band CLOUT!. As we hear afterwards, their music is multifaceted enough on its own, but Kwes [o=o] does nice things with pitched-down vocals and additional chaos. I first heard Mr Lager on one of the excellent recent Various EPs, so it's nice to hear him/them/her return with a new single, which is a song, no less. We heard the Distance remix, but the Silkie and Von D are both great too. Whether it's dubstep or not is a point probably not worth arguing, but grime maestro Terror Danjah has done a very fine remix of Admiral Bailey for Greensleeves’s dubstep series. And Old Apparatus are perhaps the most interesting group to come out of the dubstep scene in recent years, akin to Various (Production) a few years back, and they're similarly mixing English folk with dubstep with this impressive new one. In the wake of the fantastic new 13&god album I played a bunch of The Notwist last week. I took myself back to the compilation that "Scoop" originally came from, and found a lovely remix by English duo Isan, which I thought I should play you tonight. Also another track from Sam Genders' post-Tunng project Diagrams. Great songs and nice arrangements — I love the strange loping 3/4 drum machine here. But the best and most surprising juxtaposition of the week comes from Katie English's flute and production with Kieron Phelan's everything else in littlebow. You wouldn't expect the flute to lead a proggy post-rock rhythm section, or suit an array of folktronic remixes, but this album (with the cutely arch title The Edge Blown Aerophone) takes the instrument to places it's never been. And we're not talking the (somewhat) corny folk rock of Ian Anderson in Jethro Tull. Well, not really. This is a marvellous little album, worth seeking out. Via some blog I discovered this week the Norwegian experimental/drone artist Sjøli. Head over to the linked Bandcamp and grab that EP - for a mere USD$3 you'll get some stunning sounds, especially the bewitching middle track I played tonight. Equally awesome — and Australian! — is the new album from y0t0 (aka Year Of The Ox), who is based in Queanbeyan. It's shortly to be released via Fluid Radio’s digital label fac-ture, and takes you on an epic journey down Uriarra Road. Crackling drones, beautifully-recorded guitar and field recordings are set against various notables remixing the tracks, and it sounds like it's going to be one of the albums of the year. Pre-order it here. Perhaps the biggest surprise of the week is hearing drone/improv-sters Gareth Davis & Machinefabriek tackling Jazz Standards. I only know one of them, but "My Funny Valentine" is rendered with deep detail and emotion. Finally, I wanted to cover some of the music by the artists I'm featuring next Saturday night at The Gate Presents (see previous post). I'm very excited to be able to bring three wonderful musicians to this gig. We heard Gail Priest’s processed vocals and guitar, and some sparkling electronic sounds. From Part Timer we went all the way back to his earliest tracks, when I first became aware of him, at which point he discovered I'd played him and started sending me enormous amounts of amazing music. You can hear how creative he was from the start, and just how accomplished his production has become over the last 6 or so years. Ollie Bown’s release music is mainly through his duo Icarus, one of whose early drum'n'bass workouts closed the show. We also heard the recognizably drum'n'bass pulse of "Gnog", from further down the track when their interest in free jazz/improv and electro-acoustic music had asserted itself. But Ollie is also a dedicated collaborator and improviser, and the duo track with Tom Arthurs showcases a beatless and beautiful side to his work. 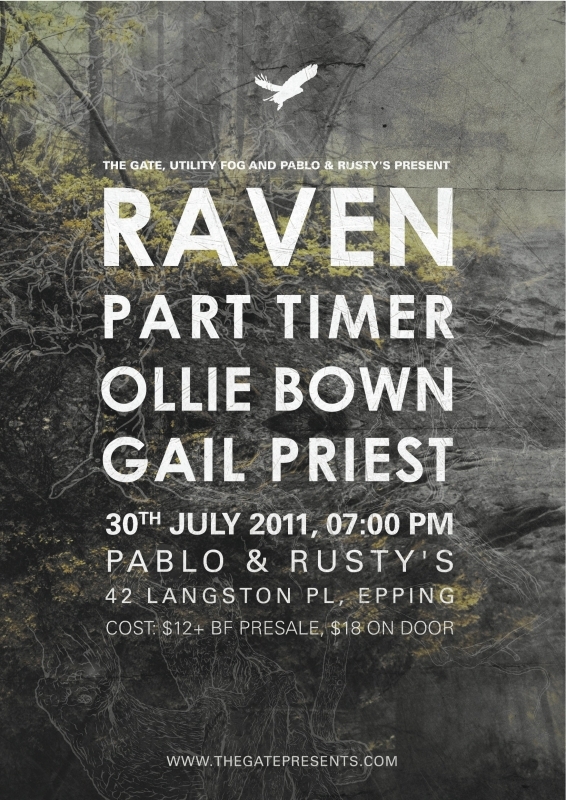 I'm very excited to present the beautiful flyer above for a gig I have curated under the Utility Fog banner featuring me as Raven (as requested by Joe of The Gate, who runs the series) along with some of my favourite Australian musicians. 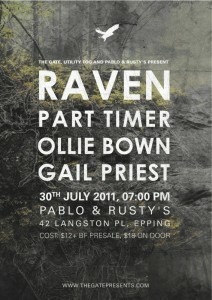 It's on Saturday the 30th of July, and features Gail Priest, Ollie Bown of Icarus, and a rare appearance in Sydney of Melbourne's Part Timer. So, pretty much Utility Fog city. Please come and hang out with people of great musical taste and people of great musical talent! Joe has a great promo page over at The Gate site with some handy blurbs on the musicians. Note the location: 42 Langston Pl, Epping is basically right across from Epping Station. 25 minute train trip from Central Station. Get on it! Some great sounds for you tonight! Many highlights, see below! LISTEN AGAIN via the link at the bottom, or the podcast of course. The new 13&god album is seriously good — so much better than either the recent Notwist or Themselves efforts. But together these artists seem to inspire each other in interesting ways, the Notwist's melodicism and emotion tempering Themselves' abrasiveness, while Themselves' beats and noises keep the Notwist's recent MOR tendencies in check. More from them later, but I needed to get right into a hugely exciting Utilty Fog exclusive (for now), as I've just been sent a promo of the forthcoming vieo abiungo remix album. It'll be up for preorder from Lost Tribe Sound in just over a week. First off, though, we heard a non-album track which will only be available through Lost Tribe Sound's mailing list. Its sparse beats and autotuned vocals see William Ryan Fritch channeling James Blake — a bizarre but strangely appropriate blend, still with Fritch's world music vibe. A quick detour into James Blake himself, through an awesome bootleg remix created by Sun Hammer and available for download from his soundcloud — using just a sampled phrase from Blake and taking the sparse 2step beats into gradually noisier territory. I came across Sun Hammer through his remix of vieo abiungo, a lovely thing with acoustic guitar and growly dubstep bass. More radical is Benoît Pioulard’s, which essentially sounds like whatever Thomas Meluch does when he's being Pioulard — which is a wonderful thing, mind you. Nick Zammuto from The Books continues to release tracks from his new solo project, one at a time, available from his Soundcloud for one day and then intended to be shared around by fans. Nice. I played The Book of Knots last week, but intended to play a track featuring Carla Kihlstedt on vocals. That's what tonight's tune was, along with a freaky Allen Willner narration (sounding a lot like Tom Waits is has to be said) and some massive crunching guitars. Loveliest release of the week comes from Esmerine, the cello and percussion postrock/post-classical Godspeed spin-off group. Much less angst than Godspeed or A Silver Mt. Zion, it's positively pretty througout, even when it does get more postrockin' or sad. Produced by fellow Montrealer Patrick Watson, it also features his piano and vocals on a few tracks. In between Esmerine tracks we heard from Perth prog/jazz/postrock band Tangled Thoughts of Leaving, whose debut album revels in excess — there are frequent glitchy granular processing and hard disk edits around the jazzy piano, prog riffs and general postrock approaches in the mostly very long tracks. I haven't worked out yet whether it's ridiculous or awesome, but it's fun. Next up, we heard some of my earliest encounters with some of the members of 13&god. The Notwist’s Neon Golden is a stone-cold classic of indietronica, but in fact I first heard them on a standout compilation back when the Morr Music label was doing interesting stuff, called Putting the Morr Back in Morrissey. The Boom Bip & Doseone album Circles was, in 1999, unlike any hip-hop I'd heard before — Boom Bip juxtaposing arcane samples and bizarre source materials with brilliant beat-juggling around Doseone's stream of consciousness beat poetry and his characteristic nasal twang. He was soon to become ubuquitous. It's still pretty awesome listening, but the track I played tonight has always been a standout. And after some more 13&god it's time for Skeletons. Their new album has struck me upside with a... thing that you... anyway, not an idiom I'm up with, but it's really great, that's what you need to know. Quirky as all get out, with intriguing lyrics, unexpected harmonies and melodies, and some ultra-catchy songs. We heard Sydney's Tim Fitz last week I think, but here's another excellent cut, driven by rhythmic piano, which I was reminded of at one point in the previous Skeletons song. Great to finally have something new from the songwriting half of the original Tunng, Sam Genders. Diagrams’s debut has everything that the latest Tunng album unfortunately lacked. Great songs, that is. The production isn't quite as experimental as Tunng used to be, but it's still got electronic elements combined with folky pop songs. Next up, something equally English but altogether more arcane, the latest from James "Leyland" Kirby. I've been following him since the first V/VM 12"s in the 1990s, and I have to admit the first releases under his grandfather Leyland's name left me cold, to say the least — the major key floaty piano just sounds like insipid new-age ambient music, and I don't see why it garnered so many accolades. The first two (of four) Intrigue & Stuff EPs, however, are dark, woozy pre-electronica, like Boards of Canada on methadone. Impeccably detuned synths recorded with a touch of distortion and sounding, like the best of early BoC, as if it was mastered to cassette and then left in the car on a hot day or two. Can't wait for the next two installments! Motion Sickness of Time Travel is a suitable segue, with her lovely new album. I also got the opportunity to play another track from the wonderful 2009 release A Forest Aching Cold, which you should go and get from Bandcamp right now. So good to have a new ambient album from Tom Hall, whose noise stuff as Axxonn has been ripping it up around the country lately. It sounds like he's learnt a bit from the Axxonn work, but there's plenty of thrills to be found on the forthcoming Muted Angels. Pulsating, beautiful, with occasional swells of noise. We had to hear one more vieo abiungo, because where there's a remix album, you're likely to find at least one entry from Part Timer, here as upward arrows, his most ambient guise. Speaking of arcane electronic folk, Finland's Paavoharju haven't had anything out for a while. Their new EP is partially reworked old material, but it's still a new release. We heard a mysterious track with some crunchy beats. Finally, I managed to slip in one track from my dubstep album of the year, from Silkie. This track is so full of life and joy and melody, it's always a pleasure to hear. It reminds me of Luke Vibert when he's in that mood, although the track I rustled up had a slightly different bent to it. Woah, last minute radioz as Monk Fly’s wife has just had a baby! Some interesting sounds for your Thursday night.